‘Free’ public Wi-Fi always sounds a little too good to be true and now American civil liberties campaigners have written to the Mayor of New York to tell him they are pretty creeped out about how much data the new LinkNYC booths will collect. Mayor de Blasio has so far only talked about this as a boon for the city as he expects it to generate $500 million in advertising sales but, of course, personalized ads require serious amounts of data. According to the New York Civil Liberties Union, the Ts & Cs on signing up require you to turn over your email and then submit browsing data, as well as information about the specific content you read and what stuff you click on. As identified by the NYCLU, CityBridge says it’ll only make “reasonable efforts” to clear out your data if it sees 12 months of inactivity on the network, so if you’re a regular user, you could be signing up to being stalked for life. The scheme already had to abandon part of its proposed advertising effort after a Buzzfeed investigation found that it planned on installing Bluetooth devices that would serve ads straight to people’s phones as they walked by. A similar attempt to do this in London, via smartphone tracking Bluetooth bins, was halted after concerns were raised by privacy campaigners. De Blasio has boasted about just how secure the network will be, as well as putting plans in place for it to cope if there were a hack or terror attack, but none of this touched on the data retained for advertising purposes. 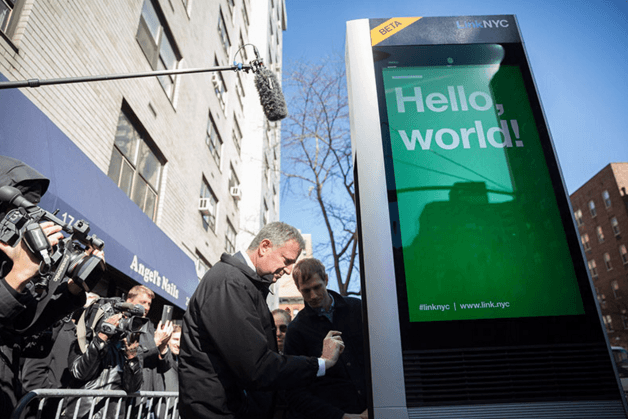 Let’s not also forget that Google, the world’s biggest advertising network, is one of the companies that’s invested in the LinkNYC via its Sidewalk Labs project. Update: CityBridge has provided a statement, but we are waiting to speak to them in order to understand exactly what data it will be collecting on users.